i saw a shop stool project from Shopnotes magazine issue 97 vol 17 requiring a piano stool hardware similar to this (c/o Lee Valley). meron kaya nito locally? or an alternative? di pa naman rush...maganda kasi combination ng wood and metal dun sa project. Last edited by violaine; 02-08-2011, 06:45 PM. Another option might be ... machine bolt and two nuts. 1 x 10" stainless steel bolt and two 1" stainless steel nuts would cost slightly less than the Irwin bench screw vise. 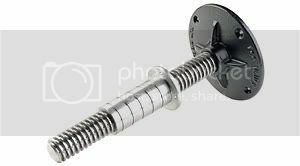 If the two nuts are spaced some distance apart, that could give more stability than the nut of the Irwin screw, though the Irwin nut is easier to affix. Last edited by guad; 02-09-2011, 12:56 AM. That might be a good alternative guad. Pardon for the ignorance, cold you please post even just a rough draft of the idea so as to confirm everyone's idea of we're of the same page. Thanks! the irwin screw vise is a no-no for me..the turning head is too precious for me to saw it off! ill go visit the bolts and nuts center and inquire. will let you know if its a success or not. Not a complete list, but just example sizes and prices (before 20% discount) of To Suy/Screw Master/Y2K. If you go somewhere else, I would be interested to know how the prices compare. Larger than 1" also available. Idea is simply to use two nuts spaced some distance apart instead of the unusual elongated nut pictured. How to affix the nuts to wood is left as an exercise. Attaching the bolt head to wood is the same exercise as doing knobs. Last edited by guad; 02-10-2011, 05:23 AM. I have piano on my house it stool was just out of order I want some hardware work of it I search about it but I couldn’t find it. So I decided to take help from the bestessays.com rating they had all names and address of repairing services also.